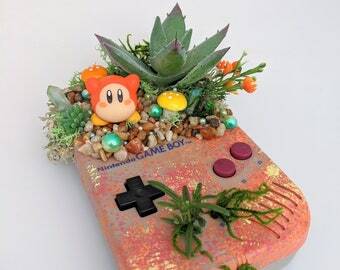 Home of the Original Gameboy Planter! Announcement Hello! Please read the FAQ at the bottom of the page. For Custom orders please visit my website WakuWakuIsland.com! Hello! Please read the FAQ at the bottom of the page. For Custom orders please visit my website WakuWakuIsland.com! Winnie's pieces are all so adorable! She goes the extra mile to make sure that you're 100% satisfied with your custom pieces. I definitely recommend her work!! 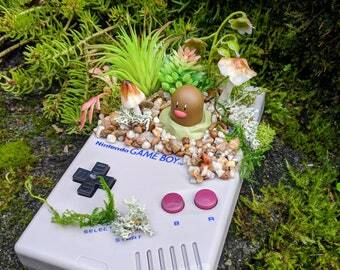 I started this business in 2016 after making my first Gameboy Planter at home. 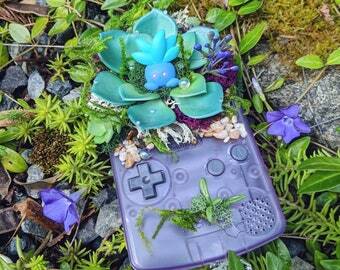 I've always liked putting plants in weird things and I have a deep nostalgic love for gaming (especially Nintendo). 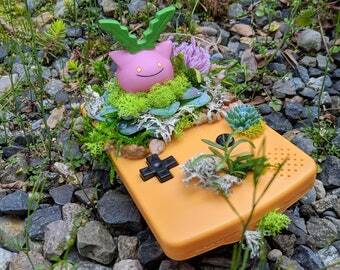 When I had this idea of making a Gameboy planter I knew I had to make it work somehow. After a lot of practice, trial and error it evolved into what you see today. No real Gameboys are hurt in the making of these products I only use new Gameboy shells made with 100% recycled plastic. The shells and toys are imported to me from companies I work with overseas. I hope you enjoy my products as much as I enjoy creating them!. Please go to my website WakuWakuIsland.com get more information on customs. Do you make replicants of your past work? Are they made with real Gameboys? NO real Gameboys are harmed in the making, I only use replacement Gameboy shells made with recycled plastic. Do you make the Pokemon figures? The toys use for my pieces are sourced from Japan, I try to stick with authentic gently used Nintendo toys from brands like Bandai and Tomy. Some of the toys I’ve even brought back myself from Gachapon machines and toy stores in Japan. 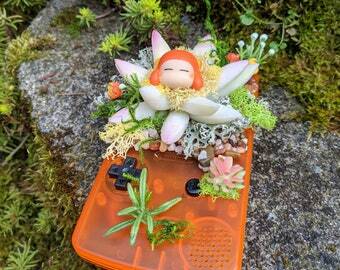 The plants are artificial and the moss is preserved, so the planters require no maintenance. Everything inside the Gameboy is strongly glued together. However in the rare event that the items are delivered to you loosely, please get in touch. I really care about the environment and I try to keep my business as green as possible. I use Gameboy shells are made with recycled plastic, and 100% biodegradable bubble wrap and recycled boxes for packing. It does make my prices a little higher but I hope you understand the choices I make are always for the best of planet earth! Why are your pieces so expensive? Unfortunately the supplies and materials I use to make these products are very expensive. Running a small business is EXTREMELY EXPENSIVE and this is my FULL TIME JOB. I pay extra to get shells made out of recycled plastic. Pokemon and Nintendo toys are always in high demand, even though I try to buy them in sets they get pricey. 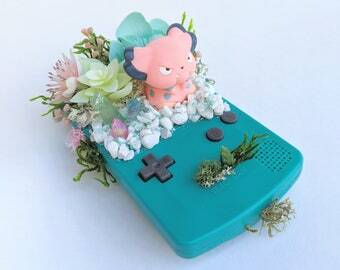 I spend a lot of time and care on my art, each Gameboy piece takes me an average of 3-6 hours to complete. Each piece is one of a kind. I do not make exact replicas of my past pieces, I may do variations but it is normally marked. I use high quality products and real crystals.